I don't have any original Eve art (yet) but I did take a trip to the National Gallery, recently, and found a couple of interesting portrayals, which you all might be interested in. 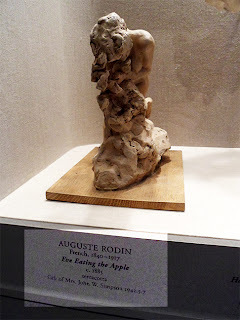 Now, those of you who follow the blog know my favorite Adam and Eve is still the Rubens from which I have formed my blogger avatar image, but this Rodin of Eve eating the apple, seemed much too fitting to pass up sharing with you! 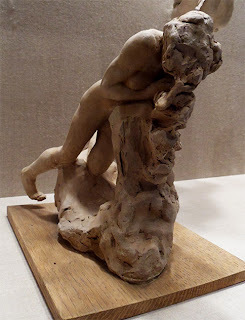 Rodin captures this element of suffering which seems to get overlooked by a lot of artists, in capturing the fall from grace -- but when you first approach the piece, it seems just like a mild headache of some kind. Overindulgence. It isn't until you come to the other side, and see the rigor and strain, the agony of the Apple's gift. Eve is in very real pain -- we see it in the awkwardness of her limbs, and it even looks almost as though she's clutching her head. This is an Eve I can understand and relate too. She isn't coy, or flirtatious, or seductive. She is real, and suffering, and struggling with her choice -- recognizing the reality of what's she's done. This isn't Eve the temptress, this is Eve the woman, waking up in a world that is suddenly, terrifyingly different. It's almost an entirely new sculpture from this second angle, and I think that's part of the brilliance of sculpture -- it changes with your approach, your perspective. You can look at a sculpture for hours, shifting your weight incrementally, and finding something new in it. 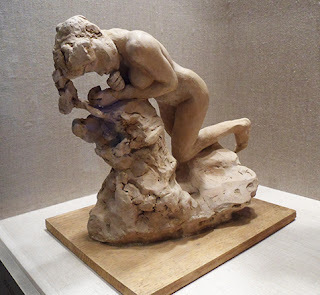 And the more time I spend looking at art -- any art -- the more I come to the realization that sculpture is really my favorite. That is incredible. I've never even entertained the thought that gaining all that knowledge might be painful. I love the way people can bring you to a completely new perspective through art. Be it sculpture, paintings, or even the written word. Amazing find!